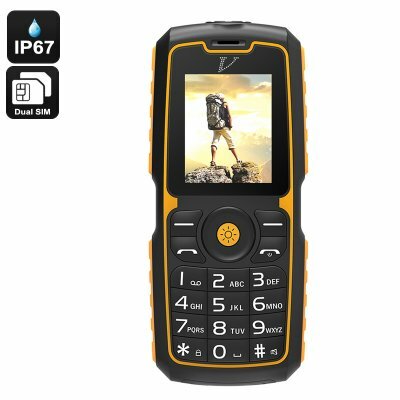 Successfully Added Rugged Cell Phone - IP67 Waterproof, Bluetooth, Dual-IMEI, Flashlight, Power Bank Feature, 1300mAh Battery to your Shopping Cart. If you’re looking for a tough and simple cell phone that keeps you connected no matter where you are, the No.1 A11 is perfect for you. This regular mobile phone features a durable IP67 body. Thanks to this, it is fully resistant to water, dust, and drops. Additionally, it has been designed to withstand extremely low temperatures. With this outdoor phone at your side, nothing will stop you from staying connected to friends and family back home. It comes with an intergraded flashlight feature and packs a whopping 1300mAh battery. This cell brings along a stunning 48 hours continuous usage time and 9 days of standby time. With its Dual-IMEI numbers and two SIM card slots, this cell phone allows you to slide in two SIM cards and lets you stay connected to both at once. This brings along great efficiency for those of you who wish to use their mobile phone for both work and private life. On its 1.77-Inch display, the phone brings forth crisp visuals. Along with the large-button keypad, this cell phone is easy to use and can even be operated in cold weather while wearing your gloves. The phone comes with sophisticated hardware, Bluetooth, and supports up to 32GB external memory. This rugged phone comes with a 12 months warranty, brought to you by the leader in electronic devices as well as wholesale cell phones..
Arabic: - الهاتف الوعرة - Chinese Simplified: - 崎岖的电话 - Czech: - Odolný telefon - Danish: - Robust telefon - Dutch: - Robuuste telefoon - French: - Téléphone robuste - German: - Robustes Handy - Hebrew: - טלפון מחוספס - Hindi: - बीहड़ फोन - Italian: - Telefono robusto - Japanese: - 頑丈な携帯電話 - Korean: - 견고한 전화 - Malay: - Telefon yang lasak - Norwegian Bokmål: - Barsk telefon - Romanian: - Accidentat de telefon - Russian: - Прочный телефон - Spanish: - Teléfono resistente - Thai: - โทรศัพท์ที่ทนทาน - Turkish: - Engebeli telefon - Vietnamese: - Điện thoại gồ ghề.